American foulbrood (AFB) is a fatal bacterial disease of honey bee brood caused by the spore forming bacterium Paenibacillus larvae. It is not a stress related disease and can infect the strongest to the weakest colony in an apiary. Infected brood usually die at the pre-pupal or pupal stage. Heavy infections can affect most of the brood, severely weakening the colony and eventually killing it. The disease is not able to be cured, meaning that destruction of infected colonies and hives or irradiation of infected material is the only way to manage AFB. 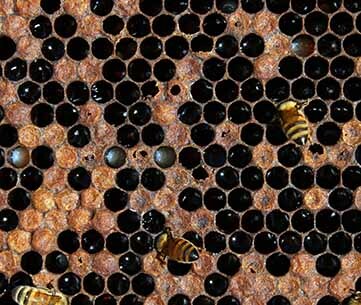 Although AFB is not highly contagious, bacterial spores can easily be spread between hives and apiaries through beekeeping practices such as through the exchange of equipment and movement of infected combs. Adult bees are not affected by AFB but can spread spores within and between infected and clean hives through robbing and drifting. AFB spores can remain viable for over 50 years and are very resistant to freezing and high temperatures. Therefore, the only way to manage the disease is to stop infections from occurring through adopting beekeeping best management practices, and if an AFB outbreak does occur, quickly dealing with it before additional colonies become infected. AFB infections start when spores on the nurse bee’s mouthparts are spread to larvae when feeding the developing brood. Only around 10 spores are required to cause an infection in a day old larvae. 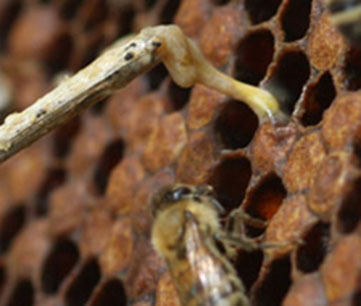 A bee larva less than 24 hours old is the most susceptible stage to be infected by AFB. The younger the larvae, the more susceptible and less spores required to cause infection. After feeding by the nurse bees, the young larvae ingest spores of the bacterium, which germinate in the larvae’s gut. The bacterium begins to multiply rapidly after the larvae have been capped, eventually killing the infected larvae at the pre-pupal or pupal stage. Once the larva has died it becomes a dried scale that sticks to the side of the cells. Billions of AFB spores are able to be produced by any dead pupae or dried scales which are further spread around the hive by adult bees as they attempt to remove the dead pupae. The disease cycle of AFB means that any spores that enter the hive are quickly spread and once they reach larvae the bacteria can multiply rapidly. The disease weakens the colony, which subsequently makes the colony a target for robbing bees. The robbing bees then carry spores back to their colony further spreading the disease and starting the cycle in a new colony. Irregular and patchy brood pattern. 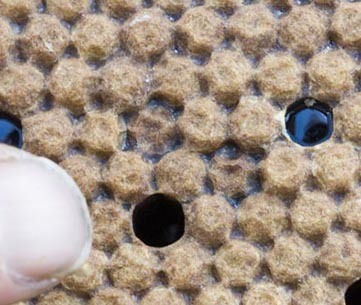 Cell cappings on infected brood may appear sunken, darker coloured or greasy. This is due to the decomposing larvae inside. 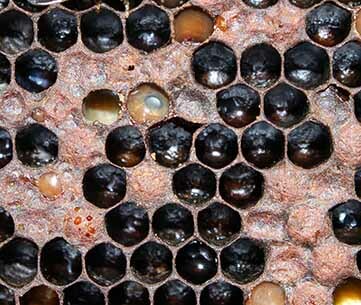 Cappings may also be perforated by bees trying to remove the dead brood (the remains of which are infective). The larvae die after capping and become a light to dark brown semi-liquid mass. Infected hives may also have a sulphurous smell due to the decomposing brood. Infected brood changes from a healthy pearly white to a dark brown (a ‘ropiness test’ can be carried out at this stage – see Detection tab). The dead larval remains become a tough, but brittle scale that is difficult to remove from the cell. If older larvae are infected the ‘tongue’ of the pupae may become stuck to the top of the cell wall. Brood combs should be thoroughly examined for AFB at least twice a year, preferably in spring and in autumn. Both strong and weak colonies are susceptible to AFB and can be infected at any time of the year so all colonies need to be examined. 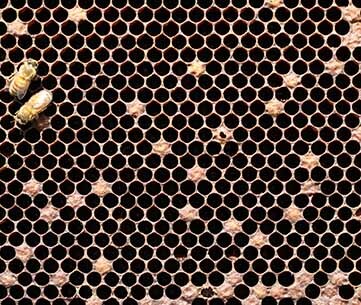 When inspecting for AFB beekeepers should remove each brood frame from the colony, remove bees from the frame and examine the brood frame for symptoms such as an irregular brood pattern, with a mixture of capped and uncapped cells. 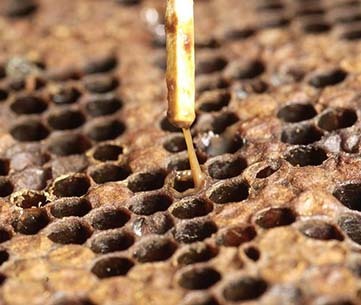 Individual cells should also be carefully inspected for sunken, darkened and greasy looking cappings as well as perforated cappings (especially if perforations are irregular shaped or located on the edges of the cap). As early AFB infections may only have one or two cells showing disease signs, it is critically important to inspect all brood combs for early detection of AFB. In the early stages of AFB infection, the adult bee population may still be quite considerable. In advanced infection stages of AFB, the adult population starts declining and a large number of cells start to show the classic brood symptoms associated with the disease. The infected brood cells also start drying out, forming tough and brittle scales in the bottom of the cell. Holding the comb to the light can help as the scale stage of the disease cycle tends to reflect the light making them visible. The hive may also have a distinct odour, resembling a sulphurous smell. Identify a suitable cell showing AFB symptoms – discoloured, greasy, perforated or sunken cappings. If the semi-fluid remains are drawn out in a 3–5 cm long dark-brown ropy thread it indicates the hive could be infected with AFB. If the semi-fluid remains are drawn out but only form a short (usually less than 1.5cm long) light grey semi-liquid mass, then the disease is likely to be European foulbrood (EFB; Melisococcus plutonius). However, EFB infections with Paenibacillus alvei (a secondary infection associated with EFB) may also cause some extra ropiness which makes EFB infected brood produce a longer thread and resemble AFB infected brood. A key means of differentiation between EFB and AFB is that EFB usually kills brood prior to capping; while AFB infected brood usually die after capping. Always remember that these are simple field guidelines, and the only accurate means to differentiate EFB from AFB is through laboratory diagnostics. AFB is a reportable disease in every state and territory of Australia. If you think you have AFB contact your local state or territory department of agriculture for assistance. Ropiness: Usually not ropey in its early stages, with some rope capable of being drawn out at around 1.5cm. In latter stage of infection, and possible secondary infection, the ropiness will increase. Appearance of rope: Slightly ropey, but more of a light grey semi-liquid mass, with some yellow seen due to tracheal tubes infected. 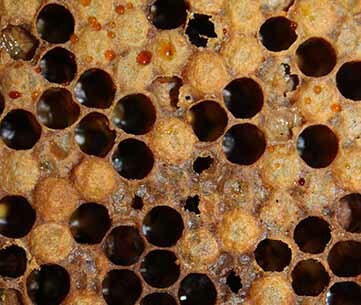 Brood pattern and stage of infection: Patchy brood with EFB cells usually containing dead, or discoloured and twisted larvae in uncapped cells. Scale: Rubbery, brown to black. Ropiness: Can be quite ropey, sometimes forming a fine ropey thread around 3-5cm. Appearance of rope: The ropey thread is generally a dark brown and can be quite elastic. 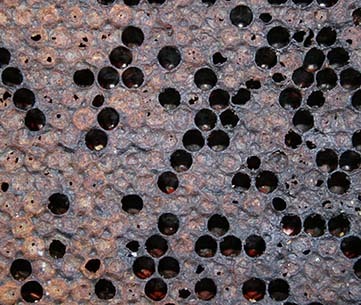 Brood pattern and stage of infection: Patchy, perforated brood. Infected brood usually die after cell capping. Scale: Brittle, brown to black. AFB can be accidentally spread by beekeepers or through the natural behaviour of honey bees. Beekeepers can accidentally spread the bacterial spores when infected combs or hive components are placed in non-infected hives. Spores can also be spread on tools and equipment. Equipment that has been used in infected hives should be considered infected and should not be used in non-infected hives. Honey and pollen harvested from hives with AFB will contain AFB spores. Beekeepers should never feed hives with honey or pollen from other colonies unless it has been irradiated. 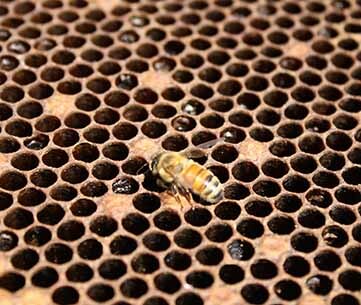 Colonies can also become infected naturally if bees within the colony rob infected hives, or by honey bees drifting from infected colonies into non-infected colonies. Swarms and absconding colonies may also spread the disease between areas; however this is less of a risk. The spores of AFB are capable of surviving for more than 50 years and are resistant to extreme temperatures meaning freezing or heating infected material will not disinfect material. Infected material (hive components, tools etc) need to be burnt or irradiated to ensure AFB spores are killed. AFB is widespread overseas and occurs on all continents where honey bees are managed. AFB is present throughout Australia; however, it has not been reported or confirmed in the NT. AFB is a reportable disease in all states and territories. Infections should be reported to your local Department of Agriculture. AFB causes symptoms that are similar to both European foulbrood (EFB) and Sacbrood virus. There are a few ways to differentiate between AFB, EFB and Sacbrood virus. 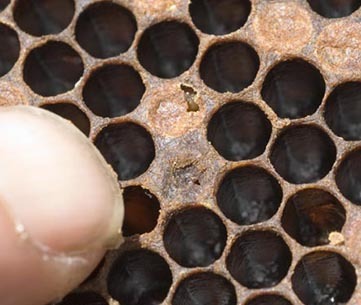 Symptoms of EFB include a patchy brood pattern with uncapped brood cells where the dead or dying larvae appear curled upwards and brown or yellow which give the appearance of the larvae looking ‘molten’ in the cell. This is in contrast to AFB where the majority of infected cells die after capping. The ropiness test (see Detection tab) is a simple way to differentiate between the two diseases. 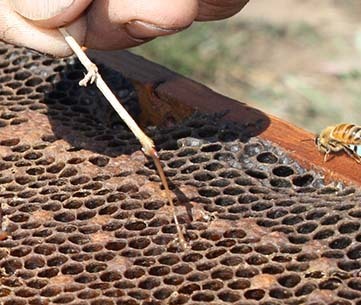 The test is conducted by placing a matchstick into the affected brood and slowly withdrawing the matchstick. AFB infected brood is usually drawn out in a longer ropy thread than EFB infected brood (~3–5 cm for AFB compared to up to ~1.5 cm for EFB). However, when Paenibacillus alvei (a common secondary invader in EFB) is present it may also cause some extra ropiness which can cause confusion with AFB. The two diseases can also be differentiated by closely examining any dried scales in the cells. EFB scales are only loosely stuck to the cells and are rubbery. AFB scales tend to adhere strongly to the cells, and are brittle. Always remember that these are simple field guidelines, and the only accurate means to differentiate EFB from AFB is through laboratory diagnostics. Sacbrood virus can infect adults but does not produce any obvious symptoms. Infections of Sacbrood virus are most apparent when the virus infects larvae. Sacbrood virus symptoms include an uneven brood pattern with discoloured, sunken or perforated cappings scattered through the brood cells. This is generally caused by adult bees trying to remove infected brood. Although the infected larvae commonly die after capping, some dead larvae can be observed with no capping. The larvae dies with its head characteristically raised toward the top of the cell and stretched out on its back in the cell (ie a banana shape). This can sometime appear similar to the patchy brood patterns which can be observed with AFB infections. Many honey bee pests and diseases occur when the colony is under stress, such as a shortage of nectar or pollen, unfavourable climatic conditions, a poorly performing queen bee or infestation with other pests or diseases. This is not the case with AFB. Both strong and weak colonies are susceptible to AFB and can be infected at any time of the year. If young larvae are fed AFB spores by nurse bees, these larvae will die after capping. The bacteria can then multiply rapidly, producing billions of spores. The nurse bees attempt to clean away the diseased pupae, but in this cleaning up process, the nurse bees become carriers for the disease and further infect new young larvae when they feed them. The number of AFB spores and population of honey bees in the colony will influence the rate of spread of the disease within the colony. The decline in the colony population may happen slowly over several months or very quickly, due in part to the number of spores in the hive. The higher the number of AFB spores in the initial infection, the quicker the colony’s death. The only way to manage AFB is to stop infections from occurring through adopting beekeeping best management practices, and if an AFB outbreak does occur, quickly dealing with it before additional colonies become infected. For this reason, beekeepers should always take into consideration the following management practices which outline what to do, and what not to do to help control AFB. 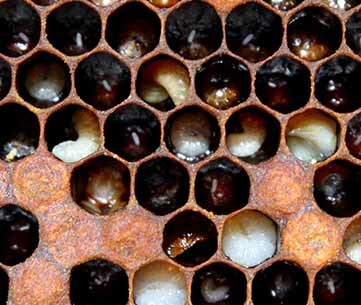 Beekeepers should check brood combs at least twice a year (spring and autumn) for early signs of AFB. As a precautionary measure, brood combs should be replaced every 3-4 years as old brood combs can act as a reservoir of the bacterium. A key aspect of good colony management also involves the beekeeper reducing or preventing the interchange of hive materials that can spread AFB amongst hives, or to different apiaries. AFB spores are very difficult to kill and easily transferable between hives. AFB can be accidentally spread on tools or via normal beekeeping practices, so look at implementing simple measures such as cleaning tools between hives and taking care when moving material between hives in order to reduce the spread of AFB and other pests. If you notice that some hives are infected with AFB, always clean your beekeeping gear before inspecting a new apiary. If AFB is detected in a colony, there are two options in dealing with the hive. The first option is to kill the colony (including the frames) and irradiate all box parts which will destroy the AFB spores. If irradiation is not possible, it is recommended that all hive components are buried in a deep pit and burnt. If the burn and bury option is followed, always ensure that the hive entrance and any other openings are closed so that bees are not able to escape. Once the hives have been burnt, bury the remains in the pit. For more information about these control measures, see the Videos tab. The main way that pests and diseases, especially bacterial diseases such as AFB, are spread between hives and apiaries is through the transfer of infected materials and disease contaminated equipment. Unfortunately, it is not always possible to know if equipment is contaminated, so it is better to be cautious to prevent spreading the pest or disease from infected to healthy colonies. One way to reduce any possible transfer is to use a barrier management system. The barrier management system is used to separate hives or apiaries into different units. This prevents the interchange of honey bees, combs, honey and hive components from one unit (hive, loads of hives or apiary) to another. The adoption of this system can also enhance traceability, biosecurity and quality assurance aspects of the beekeeping enterprise, as well as building on best practice principles. There is the ability for some honey bee stocks to demonstrate an increased tolerance of AFB through genetically inherited traits. This variation in susceptibility is due to differences in the hygienic ability of the honey bees, which influences their ability to detect, uncap and remove the infected brood. 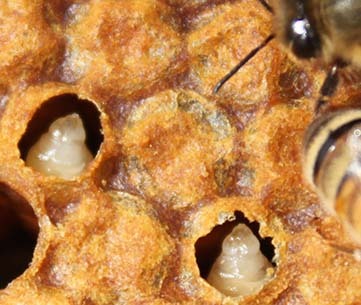 Although it is beneficial to have this AFB tolerant stock, these genetically inherited traits are not sufficient to manage an AFB outbreak and do not offer any substantial protection to a colony, especially when beekeeping equipment may remain highly contaminated and continually reinfect colonies. Antibiotic use for AFB infected colonies only masks the disease symptoms; it does not control the disease. Unlike EFB which does not produce a spore, AFB produces a spore which is not destroyed through the use of OTC. 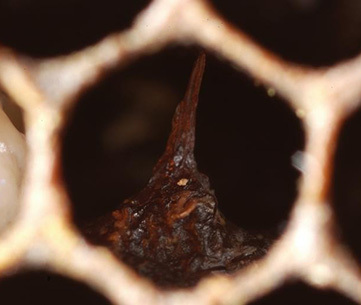 Therefore, the inoculum source can remain in a hive, continually reinfecting colonies. Antibiotic use does not extend to hive components, tools or equipment which also provides another source of reinfection for colonies. Antibiotic use can contaminate honey. Antibiotic resistant strains of AFB can begin to develop. This has already started to occur in other parts of the world. For these reasons, antibiotics such as OTC should never be used to control AFB. AFB is a reportable disease in every state and territory of Australia. If you think you have AFB contact your local state or territory department of agriculture for assistance. These videos provide information about the life cycle and biology, identification and possible management options for American foulbrood. Please be aware that some of these videos have been produced overseas, and treatment recommendations or conditions experienced may differ from those in Australia.